Finally I got my setup of ASUS UX501VW (TB3) and Akitio Node with ASUS ROG GTX1070 STRIX. I've updated both Node and laptop's firmware to the latest available, but I'm still getting some issues.. Specifically, FPS is not so good as it should be. (Tried external monitor - little bit better). CUDA-Z shows that my speed is not as high as it should be.. Any idea what is wrong? P.S. 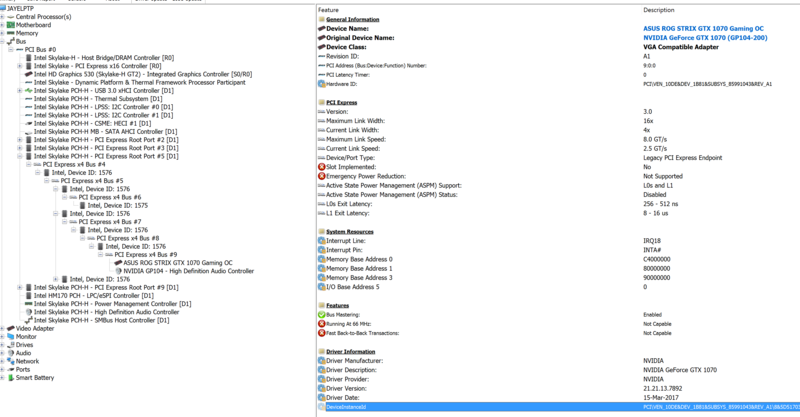 clean drivers install done, internal dGPU is disabled in device manager. I also Changed my GTX1070 to GTX1080. Are you happy with your purchase? I'm on the same laptop and I'm tempted to buy a node to boost the gfx a bit. 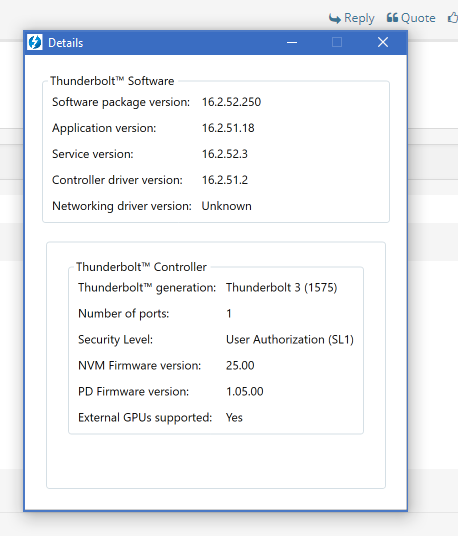 I finally got thunderbolt working, but it says egpu isn't supported on mine aswell, kind of skeptical about making the investment and not having it work. Yep, I'm happy. Of course, there is slowdown comparing to desktop pcie x16, but boost is decent still - I can play AAA games without any issues. It is also great that I can use eGPU for video editing boost. Just ignore "GPU's are not supported" - nothing is wrong except this string in software. As far as I remember, after firmware 21+ update this string states that eGPU's are supported. I recommend you to call ASUS and place a request for TB3 FW update - I did it already. More people will ask - higher chances of FW to be updated by ASUS. Thank you for the replies, I'll probably have to go with a 1060 6gb; but it should be much better than the 960m. Have you tried to connect AKiTiO Node to G501VW yet ? I have planned to buy Node for gaming with my G501VW but the firmware said doesn't support eGPU too. UX501VW and G501VW has same 1575 controller and NVM15 driver, right ? G501VW is TOTALLY (even support page provides EXACTLY bit by bit same drivers) the same laptop with same motherboard - only case (design) is different. 1. Same laptop in different "gaming" design. 3. As a conclusion of #1 : same 1575 Thunderbolt with the same firmware. Hi everyone! I have a great news for UX501VW\G501VW! I've contacted higher level of ASUS support team and they released today updated FW for those laptops. Now both updated BIOS (officially supports ASUS XG2 Station, and, most likely, other eGPU boxes) and FW update available! Some updates for my setup. 1. After new TB3 FW and BIOS update my UX501VW laptop officially shows in Thunderbolt utility "EGPu's Supported: Yes"
3. 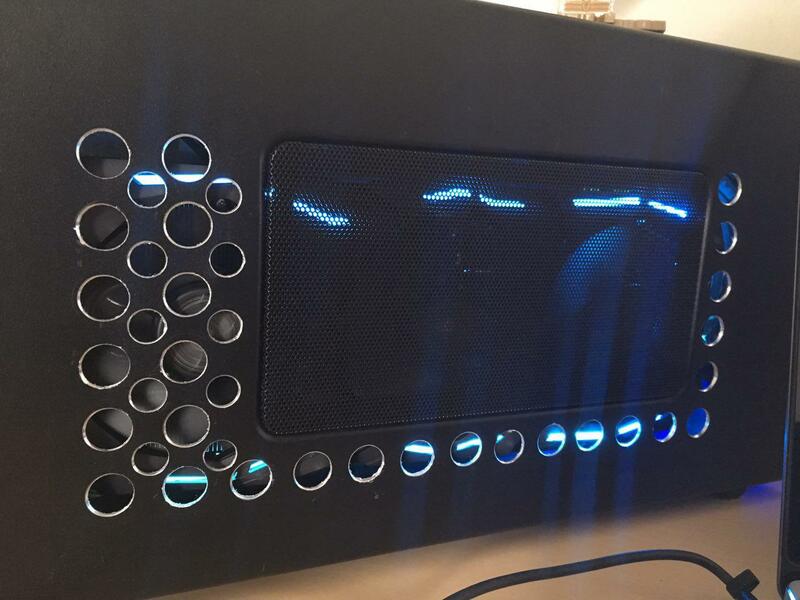 Made some airflow improvements by making some holes in Node's lid (cover). Thinking about applying some spray paint on those holes, so that they will look more natural. 1. Replace PSU with Corsair 450W - can't live with that noise of stock PSU. After having the Akitio Node and the UX501VW working for a little while, are you happy with the setup? I have the same laptop and I just bought a Vega 56 for my i5-750 Desktop. 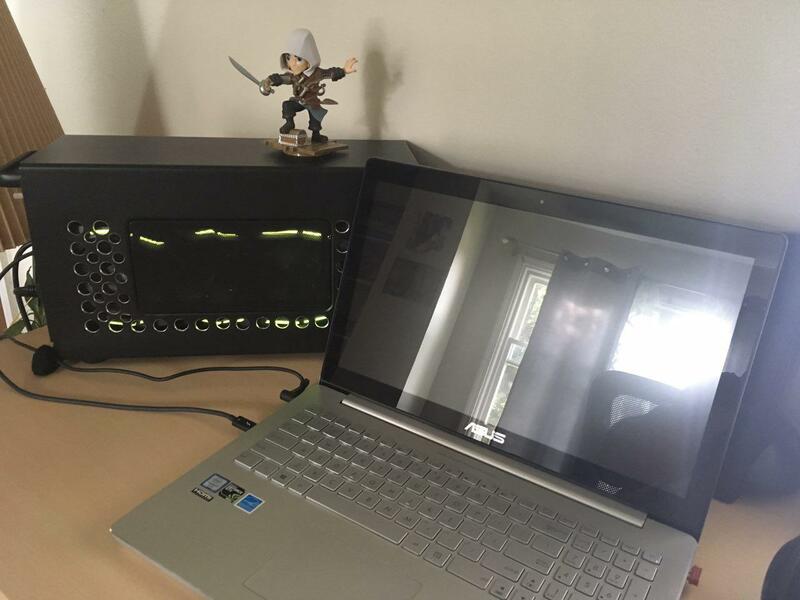 I could sell my desktop (minus new GPU), and purchase an Akitio Node to work with my laptop. I would be feeding the image back into the laptop and I would run my Oculus Rift off of that. Any thoughts or suggestions? There is an obvious fps drop on internal screen, I can’t say that I’m super satisifed, but even internal performance is way better than on 960m. There are some issues in some games (you can find my posts regarding those issues), but I would say that it is worth it. Oculus rift would not be a problem since you will connect it to your egpu box. Personally I’m looking for spectre 13 on 8th gen cpu to switch, since I don’t care about integrated nvidia gpu and I want it to be slim. It also seems like, based on my spectre 7gen implementation, laptops with no dgpu provide slightly better h2d bandwidth available. I just saw the post here and looks like @jaye is one of not too many who's using Superposition for benchmarking so i decided to run couple with the same resolution on internal display to compare it and suprisingly i'm not that far behind considering my setup(x1 2.0). When i was buying my laptop 2 years ago i thought that the USB Type C and eGPUs are going to be the future but after all this time neither are as mainstream as i expected them to be. I'm so glad that there are people who (i'm guessing) had similar idea back in the day and have actually given eGPUs a try in their current state! I've been thinking for some time now to try myself but with the negative effect of crypto on GPU prices and the prices of eGPU not going down i couldn't find the courage to do it. How satisfied are you with the eGPU solutions you have now? Would you guys advise building a whole PC or updating with eGPU? Do you think the new generation GPUs would be worth the wait? 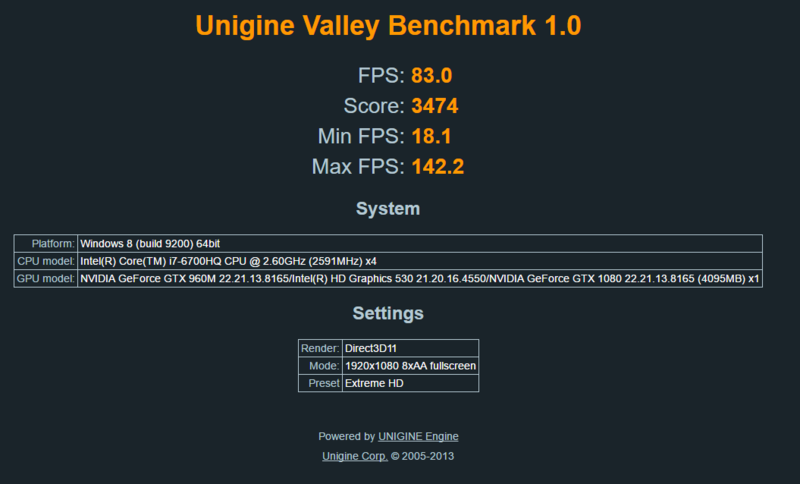 @Jaye Also, have you experienced any bottlenecking from the CPU? So, long story short - I had been looking into getting a personal laptop (I have one given to me for work but don't want to use this for my personal freelance tasks). One of the options that came up was getting a really neat second hand Asus UX501VW at a steal of a price (R9000 ZAR - which is about 660USD). So, during my research, I came across this thread as I had wondered about potentially getting an eGPU setup with my prospective Asus notebook. I loved the idea of having my full-time laptop turn into my desktop gaming rig with the addition of an eGPU, and with the awesome report that @Jaye has been giving I felt confident to take the leap. (Thank you @Jaye, you're a legend). Well, now I own this Asus UX501VW and yesterday acquired an AORUS GTX 1070 Gaming Box to pair with it for some gaming. Turns out the AORUS GTX 1070 Gaming Box works like a charm and the performance gains are awesome (I've not thoroughly tested it, but my FPS on Dying Light Enhanced Edition - High Settings - went from ~30fps on the integrated GTX960m to ~95fps with the AORUS GTX 1070 Gaming Box). So if you're still wondering whether eGPU can really work - answer is YES! Go for it. But let me get to my question now - and this is perhaps a silly one, but for the life of me I cannot figure it out. How do I get the Asus UX501VW set the AORUS GTX 1070 Gaming Box as primary GPU when no external screen is plugged into the AORUS GTX 1070 Gaming Box? It always uses the GTX 960m dGPU, and the GTX 1070 just sits hovering doing nothing. Help? Am I missing something simple? Would deeply appreciate some input. 1. Any reason why this external setup couldn't run 3 monitors? 2. does it connect via the USB-C port? 3. can you simply unplug the eGPU from the laptop while it's running and will it switch back to the internal display? thanks for all your efforts getting BIOS support from ASUS.